Are you are looking for a unique and FREE gift to give this Father’s Day? One based on the Bible that will let him know just how much the family cares? 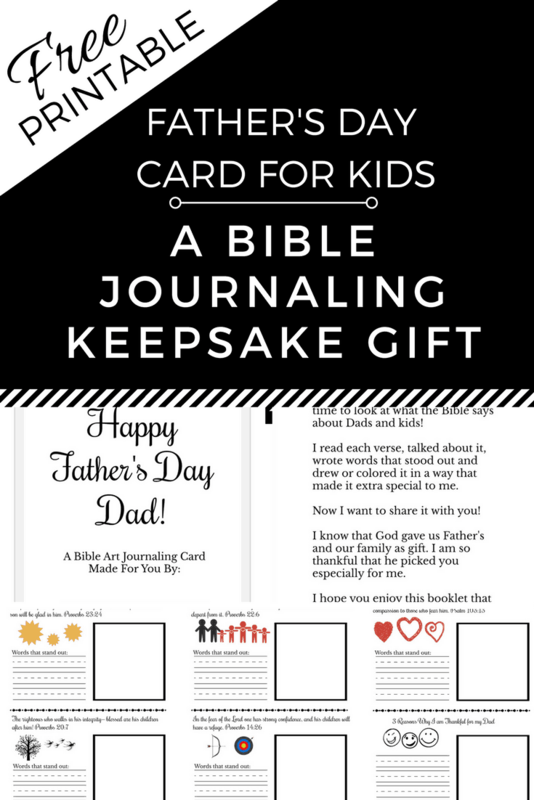 We have created this Bible Journaling Keepsake Card for Dad and we would love to share it with you too! Oh yeah, and it’s an added bonus that it will get us into God’s word WITH our kiddos! You can do this in one sitting, or choose to do one each day leading up to Father’s Day! There is a cover to personalize, and a letter explaining a bit about the gift. Next, we took 5 Bible verses (ESV version) that speak to Father’s or children and created a half-sheet mini journaling format for each. They can read the verse (or read with you), discuss what they thought about and how it pertains to Dad or your family. Then there is a space to write words that stand out ( or if older they can write the whole verse ), followed by an area to write or draw about the verse! The last half page is where they write and draw 3 reasons why they are thankful for their Dad! When you are all done, print it off and either staple or three hole punch with ribbon or string to hold it together. You also may want to grab some of our FREE DIY Printable Faith Stickers for Bible Art Journaling to decorate the cover of this keepsake gift or any other projects! They can be printed on standard address label sheets. You can access the Father’s Day Card Keepsake and the Stickers for FREE by signing up for our Encourage Community Freebies Hub! So there you have it! A Father’s Day Card Keepsake that they can give as a card or as a gift! While we are talking bible journaling, I have to ask, have you given Bible Journaling a try yourself? Maybe like me, you are thinking ..
I’m NOT creative? or I bet Bible journaling costs too much! I hear you! I have some FREE tools for you to show you that you CAN do this, do it affordably and enjoy it as well! My friend Sara from The Holy Mess has a 5 Days of FREE Bible Journaling Printables + E-course created just for you! The emails are packed with help! You will get step by step instructions, tips on making it affordable and getting help with fun fonts, doodles and more! It has lots to help you get started and it’s all FREE. 5 Days of FREE Bible Journaling Printables + E-course created just for you! This is your chance to give Bible Journaling a try! Make sure to sign up to get started on Day 1 today! And if you are looking for some more Bible Study and Art Journaling for your child (ages 8-12+) , I have a super fun Fruits of the Spirit e-course for Kids! Go ahead and click on the image below to sign up for our FREE 10-week e-course! Whatever you do, I encourage you to give this Bible Journaling thing a try! It can be a great way to dig into the word, be personal with the Lord and have fun being creative! What are you going to try today? Leave a comment and let me know, I would love to cheer you on!